This gorgeous Chair & 1/2 and ottoman has beautiful style and will add a tremendous amount of function to your living room. You have the ability to choose from many different fabrics to find what's right for your home and tailor this over-sized chair and ottoman to fit with your person style. It's classic design enable this chair and a half with ottoman to fit in many homes, transcending different home design and style choices. 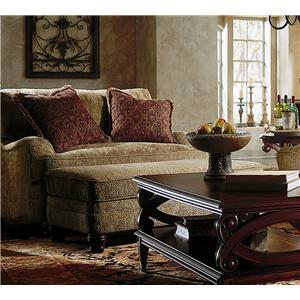 The Tarleton Chair and a Half and Ottoman by Bernhardt is available in the area from furnishingretailers.com. B4261 Ottoman 1 52" 27" 18"
B4263 Chair & 1/2 1 54.5" 44" 39.5"
The Tarleton Collection is a group of traditional living room upholstery furniture with a unique design and beautiful characteristics. The low profiled, pleated, set back arms combine with beautiful turned, wood legs and help create a magnificent design. These pieces of living room furniture will help create that warm, inviting, classically designed atmosphere you crave for your home.. Choose from many different upholstery options, to customize the Tarleton Collection to fit with your unique style and home design. Tarleton consists of a Sofa, Chair & 1/2, Ottoman, Love Seat and Sectional Sofa. Plenty of seating options to help make the most warm and friendly living environment possible. The Tarleton collection is a great option if you are looking for Traditional furniture in the area. Fabric Options A full line of top-grain, fully Analine dyed leather products in a variety of leathers, fabric/leather combinations and finishes. A wide variety of fabric combinations and finishes are also available. Arm A low profiled, set back arm. Leg or Skirt Exposed wood, turned legs. Frame Construction Frames utilize engineered, multi-ply hardwood plywood as well as some 4/4” and 5/4” hardwoods. (Certain frames may also incorporate formed plywood in order to achieve certain frame contours.) All exposed wood frames employ 5/4” mixed hardwoods. Seat Support This upholstery has a reputation for fine craftsmanship. Using long-lasting steel springs, and other durable materials, skilled artisans assemble the upholstery with your ultimate satisfaction in mind. Warranty A lifetime warranty on frames & springs and a 1 year warranty on cushions applies for protection against defects & loss of resiliency if it remains upholstered in original fabric & under normal conditions. Won’t cover damage from abuse or shipping. Browse other items in the Tarleton collection from furnishingretailers.com in the area.